Ready to move to Sun City but you don't want to wait for a new build? This Hideaway model home, in a cul- de-sac, is better than new. Less than 1.5 years, this home has all the current finishes including white cabinets with roll out shelving, stunning wood-look Luxe flooring, neutral wall paint, large counter height island, and, are you ready, a 6' garage extension. The master bedroom, with a bay window, also has a door to access your patio. The back yard is elevated, landscaped and ready for your finishing touches. Perhaps a row of olive trees for a Tuscan feel, or your own oasis with a pool surrounded by Mediterranean palms. 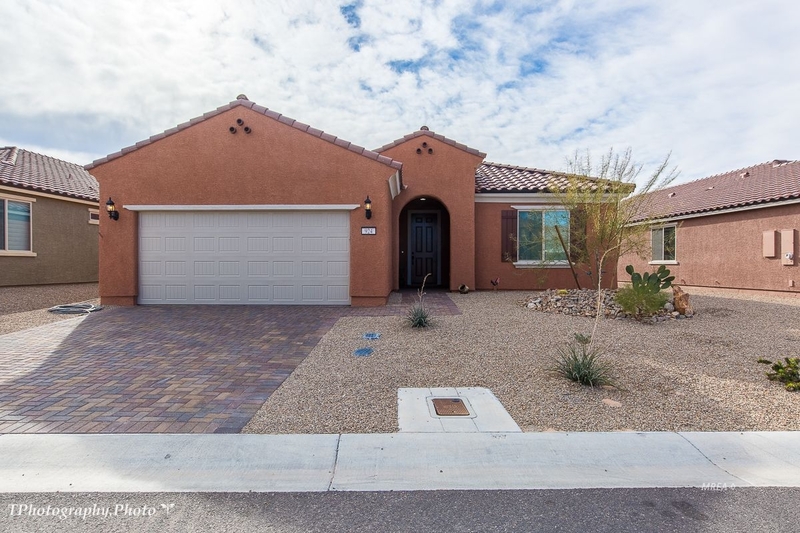 Whatever you choose you will not want to block the SE side stunning mountain view or the SW mesa view. This 2 bedroom home has an extended laundry area that the current owners use as an office/hobby space. There is an upgraded water softening system already installed. This home has over $70k in builder & after market upgrades including finished garage with extra insulation. Washer, dryer, and refrigerator are included. Partial furniture package available!